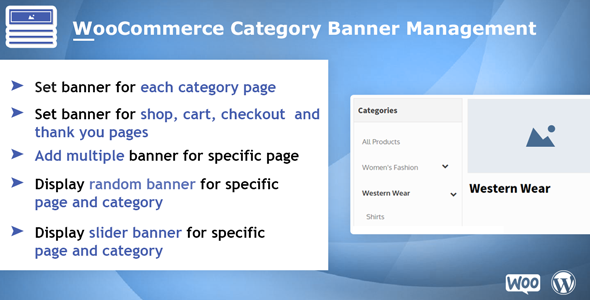 Woocommerce Category Banner Management plugin that allows you to manage page and category wise banners in your WooCommerce store.You can easily add single banner and Multiple banner for page and category in WooCommerce stores. Allows you to add a single banner image to a specific page of the website.You can configure banner for particular time periods and add custom link of that banner also. Allows you to add a Multiple banner image to a specific page of the website. you can configure banner for particular time periods and add custom link of that banner. Displays the banners that you specify by the order of their position every time the page is refreshed. Add Category Banner Using this feature you can easily add category wise banner and link at the top of your product category page. Easily update the image through your product category edit page. you can Manage " Page Specific Banner" and " Category Specific Banner "
you can add Banner URL/LINK for a particular banner.